How about Lionfish for Lunch? 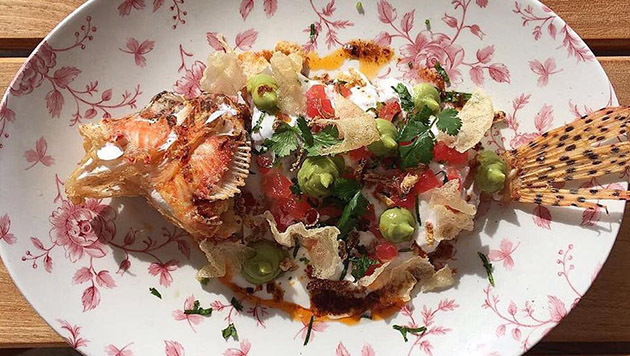 A summer meal at Marcus’ Bermuda included lionfish ceviche with avocado, kafir, pickled watermelon, and puffed rice chips. 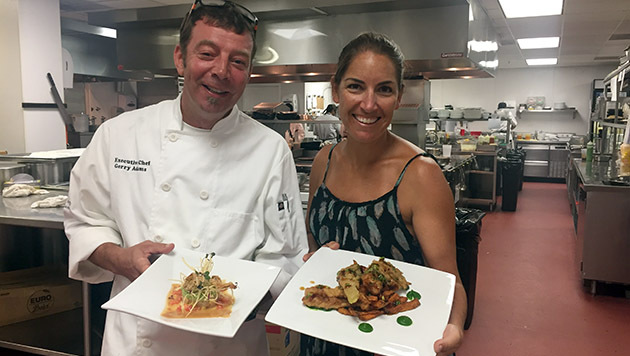 The Hamilton-based restaurant is among three local establishments that recently partnered with BIOS scientist Gretchen Goodbody-Gringley to help lessen the impact of invasive lionfish on Bermuda’s native fish populations. Photo courtesy of Marcus' Bermuda. The quest to remove invasive lionfish from Bermuda’s reef ecosystem has taken a decidedly delicious turn. As part of a new research project led by BIOS coral reef ecologist Gretchen Goodbody-Gringley, fresh lionfish is now being delivered on a monthly basis to two island resorts and restaurants—Rosewood Tucker’s Point and Marcus’ Bermuda—as well as a local grocer, The Supermart Ltd. The project, funded by the European Commission through the Biodiversity and Ecosystem Services in Territories of European Overseas (BEST 2.0) Programme, hopes to demonstrate that targeted removal of predatory lionfish will reduce the pressure on local reef fish populations. A secondary goal of the project is to determine local market demand for lionfish as the first step in creating a sustainable lionfish fishery. 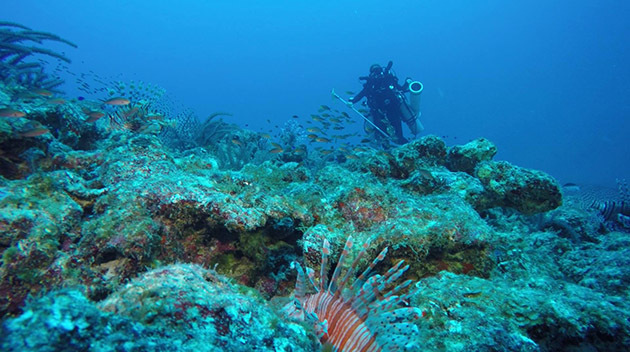 Each month, Goodbody-Gringley and her team—including co-investigator Tim Noyes, a research specialist at BIOS—survey reef fish populations and lionfish density at three reef sites located at 196 feet (60 meters) depth on the east end of the island. After counting and spearing the lionfish, they take a variety of biological samples, such as clips of their fins for genetic analysis, and then place the fish on ice for delivery to partnering restaurants and retail outlets. Executive chef Gerry Adams at Rosewood Tucker's Point and Goodbody-Gringley display one evening's meal offerings, which included tartar of spear-caught lionfish and crisp tempura of lionfish with sweet potato fries, bok choy, and mint puree. Executive chef Gerry Adams at Rosewood Tucker’s Point received his first delivery of 45 lionfish in early August—enough to create appetizers and main courses for the next four evenings. Adams created a variety of appetizers, including lionfish tartar with fresh Bermuda corn, pickled jalapenos, avocado mash, and tomato miso dressing. A creamy lionfish bisque, finished with Marsala wine and cream, included chunky vegetables, gruyere cheese, and chorizo sausage. Diners also enjoyed lionfish ceviche with fresh lime, tomatoes, mint, cilantro, and miso paste. He put equal creativity and local flavor into the creation of main courses. One featured lionfish tempura with sweet potato fries, bok choy, and mint puree with a soy scallion sauce. The pan-fried lionfish included glazed banana, toasted almonds, avocado rice, Bermuda carrots, and lemon butter sauce. Guests could also choose flame-grilled lionfish with baked cauliflower, mascarpone mashed potatoes, zucchini and carrot ribbons, and a lemon butter sauce. Adams said that lionfish are a well-known concern among the culinary community. Each reddish-brown striped fish spawns millions of eggs annually. The species, which has no natural predators in Bermuda, also has a notoriously voracious appetite that contributes to the decimation of native reef fish populations. “As a conscious food purchaser and menu planner, I felt it was essential to bring these concerns to our guests and staff to reach a wider community,” he said. He added that the fish are prepared to eliminate their venomous spines so they pose no risk to diners. After promoting the first week’s lionfish menu on social media, Adams crafted a similar menu with a second delivery of lionfish that sold out on the first evening. Diners widely requested the lionfish soup, prompting Adams to consider publishing a recipe (and tease at the possibility that he may have created a rival to Bermuda’s famous fish chowder). On the retail side, Alex Hooper, the meat market manager at The Supermart Ltd. on Front Street, has experienced similar success when offering whole lionfish for sale in his cold cases. 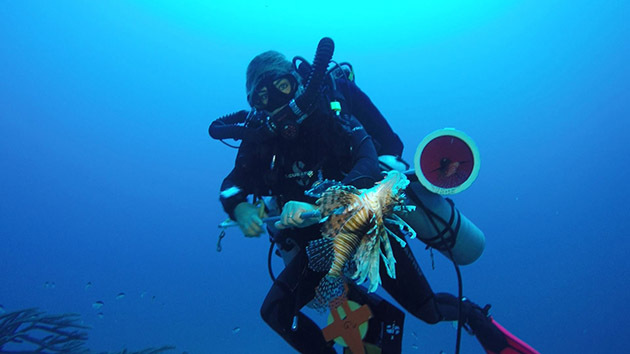 The Supermart Ltd. has supported lionfish retail efforts in the past through a partnership with the Ocean Support Foundation, a Bermuda-based organization that provides technical diving support, outreach, education, and research collaboration to address the issue of invasive lionfish. Hooper said he partnered with Goodbody-Gringley on this project to support the removal of invasive lionfish for ecological reasons and because he saw an opportunity to promote lionfish as a food source and sell a unique product not offered at other markets. Goodbody-Gringley and her team will continue to sell fresh lionfish to the project’s partners through December, with proceeds from the sales going directly back to support ongoing research. She will then meet to discuss their experiences and use surveys to determine market demand, with the goal of sharing results with local stakeholders as part of the island’s continuing efforts to develop strategies for reducing the lionfish population.